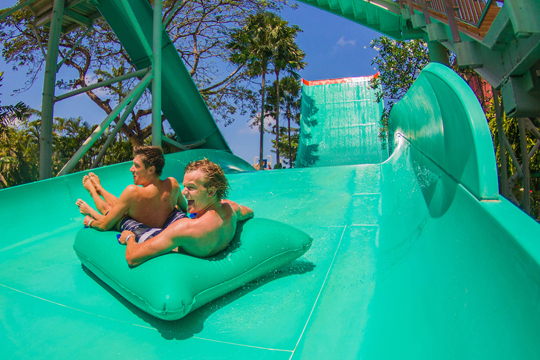 Located in the heart of Kuta and rated as Asia’s number one water park by Tripadvisor, Waterbom Bali is a magnet for fun-loving visitors who can safely enjoy some of the best water-based rides and attractions in the region. Conveniently located, guests can experience a range of internationally designed and constructed slides, including the adrenalin pumping Double Twist, a double loop ride that provides an unrivalled combination of speed, twists, turns and thrills, or test their nerve on Asia’s steepest slide – The Climax. For a more relaxing experience, try the Lazy River or hangout in a private gazebo nestled within the expansive gardens whilst basking in the tropical warmth and sunshine. Beyond Waterbom Bali’s world-class slides, built and maintained to strict international safety standards, lies a carefully landscaped sanctuary of gardens and water systems representing the beauty of the island. Waterbom Bali also prides itself on the extensive range of food available throughout the park, including hand-made 48-hour leavened pizzas, as well as alternatives for the health conscious. For a thrill packed fun-filled day out, Waterbom is sensational.